Maintain your mommy-groove and achieve your writing goals! Exclusive interviews with traditionally published novelists who are also busy moms, including: Julie Buxbaum, Therese Walsh, and even a special statement from Jodi Picoult! You’ll also receive interviews with eight bestselling author-moms like Julie Buxbaum, Therese Walsh, and Kristina Riggle, 27 printable worksheets, a printable recipe booklet with quick and easy meal ideas, and a bonus menu planner. Take charge of your life today. 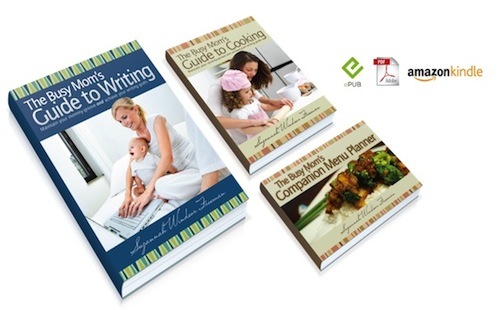 Discover how The Busy Mom’s Guide to Writing can help you indulge your passion for writing and enrich your family life at the same time.